This type of ball bearings has two raceways in the inner and a common sphere raceway in the outer ring .it owns an inherent self-alignment property. That the angular misalignment permits within the range of 1.5°to 3°. They are particularity for applications in where misalignment that arise from errors in mounting or shaft defection. 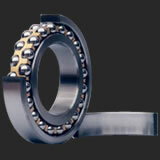 This type of bearings is mainly used to carry radial loads. At the same it can also carry a carry a certain amount of axial loads. Although the loading capacity of this type of bearings is low yet it is subjected to high-speed rotation. Bearings of type 1000K with tapered bore (1:12) and with an adapter sleeve for definite position fixing on the smooth shaft are mainly used for the shaft without shoulder. This type of bearings is convenient if mounting and dismounting. Besides one can adjust the radial internal clearance.